I can’t take any credit for this recipe. Even though I have not copied it from anywhere it is a very standard meringue recipe which you will find all over the internet! Even so, it is a nice and simple recipe and once you have mastered the basic meringue mixture there are a lot of things you can do with it. Try experimenting with flavour and colours. 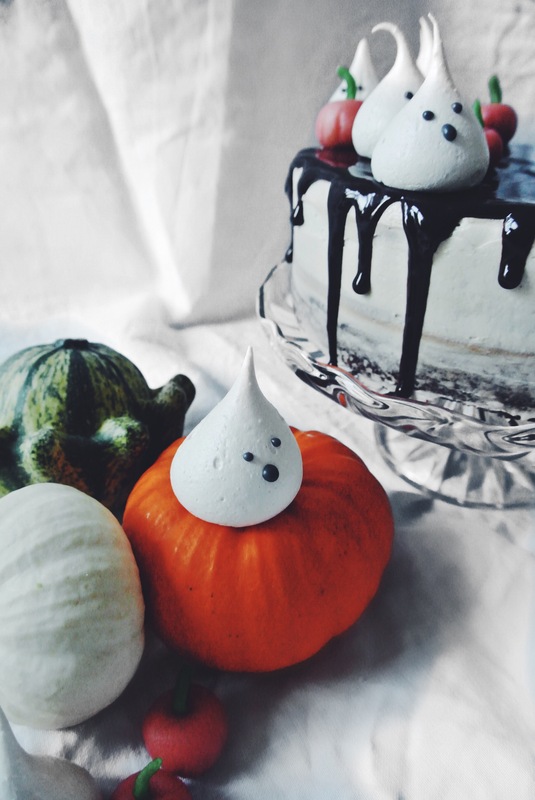 These spooky little ghosts are great for decorating cakes too! It is best to use a freestanding mixture of electric hand whisk for this recipe (or you will need a serious amount of arm strength!). Start by wiping your bowl and whisk attachment with lemon juice or a little bit of vinegar to get rid of any traces of grease. Add the egg whites to the bowl, whisk on a low setting to begin with, until lots of little bubbles start to form. When this has happened turn the speed up and allow the egg whites to reach stiff peaks. Once the egg whites have reached stiff peaks add the sugar a tablespoon at a time. Once all of the sugar has been added, whisk until the mixture is glossy and has reached stiff peaks again. The best way to tell if your meringue is done is by rubbing a bit of the mixture between your thumb and forefinger. If you can feel sugar granules, put the mixture back on for a few minutes. The mixture is ready when you can’t feel the granules anymore. Carefully spoon your egg whites into a disposable piping bag. Cut the bag at the end so you have an opening which is about 1.5cm wide. Pipe a little meringue mixture into each corner of a baking tray and use it to stick down a sheet of baking paper. Pipe your meringue ghosts by holding the piping bag a few centimetres above the baking sheet, squeeze a little and then once you have a nice base, stop squeezing and pull up. This may take a little practice but you will get there! Bake in an oven which is preheated to 100c for 30- 40 minutes or until they come away from the baking paper easily. Once the meringues have completely cooled you need to make the mixture for decorating the faces! Sieve the icing sugar in a small bowl. Add a few drops of water and mix until you have a thick pipeable paste. Be careful as you won’t need much water at all! Finally, add a few drops of the black food paste. Mix until you have an even smooth paste. To pipe the faces I make a small piping bag out of baking paper and cut a very small hole in the end. You could also use a piping bag with a really small nozzle. 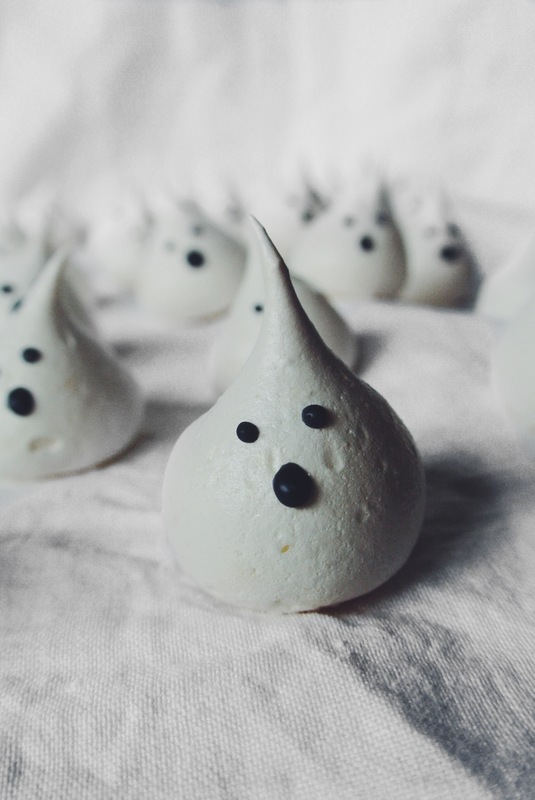 Then have fun piping faces on to your meringue ghosts! Love these guys and don’t even like meringue! Thank you! I know what you mean, I only like meringue with things. I couldn’t eat one by itself!